Well, it's freezing and snowing outside here and I have no wish to step out of my front door. Instead I'm gonna warm myself with some atmospheric metal from Russian's Cosmonauts Day. Firstly though an apology, as this has been sat in my review pile for sometime. 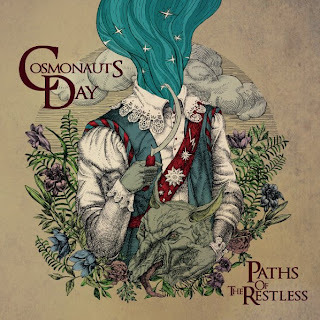 Cosmonauts Day are a four piece and this is their debut album, featuring eight tracks. There's a huge sense of anticipation as The Captain whirrs into life. There's a low-end riff underpinning the melodic guitars that create the intro, which leads to into a more structured instrumental passage. The Captain is made up of very skilfully played instrumental music where the guitars provide the melody and hint at the bands experimentation. At eight minutes in length, it's a long song to start with but it sets the scene for what's to come. Cosmonauts Day are able flit between lengthy compositions and shorter pieces, like second track The Art of Being Nothing. Here the drums come to the fore a lot more and provide good direction for the rest of the band. The song has some epic thrash metal overtones and there's not the histrionics you associate with progressive metal, but for me it could do with some vocals over the top to add some extra colour. That's a minor complaint though. Cave Of Trees takes the band back to lengthier climbs. There are some middle-eastern influences in some of the opening melodies, which is nice to hear. The song has the kind of pace to it that would equally mesmerise you and have headbanging in a slow but violent manner! Sitting and staring out of my window at the perfect white sky, while listening to this record is very trippy, but I guess that's the kind of effect that the band is going for. These guys have immense talent. Their songs are progressive, but they're not complex. They're simple and easy to appreciate and Cosmonauts day should be rewarded for that. Rift and Blackout both provide shorter snippets of the band's epic sound, with subtle experimentation and restraint, although Blackout features a lot of feedback and is a little bit of a departure from their cleaner sound. As they approach the final trio of songs, there sound changes again. Satellite seems to have more pop-sensibilities too it, with a danceable rhythm and some nice clean guitar that's the main component of the song. The Great Disease winds through ten minutes of dreamy melodies and subtle textures, which are absolute pleasure to listen too. There's even a siren like voice in the background, which fits with the music and draws you in further. It's gets heavier towards the end of the song, with driving guitar and more powerful drumming. The leads guitar works helps take the edge off it though and just leads to an epic ending! They finish of Paths Of The Restless with The Last Watchman. More clean guitars allow you to calm down after the rousing end to The Great Disease. It also puts into perspective how good this album is. Okay, it's purely instrumental and as such there are no vocals, but in the end that's not a bad thing. Cosmonauts Day pull it off very well indeed and are mature enough not to overdo things. Amazing! You can purchase digital download or CD versions from the above page, plus a number of different merch packages. Drop by their Facebook page too at http://www.facebook.com/cosmonautsday.